Tegna’s spin-off of Cars.com may well have just made domain sale history this year. As part of the business deal to sell the 19-year-old company, the domain name “cars.com” itself was valued at a whopping $872 million! Can a domain name really be so highly valued? It’s an exciting time in internet history since there are many rumblings that the sale of cars.com is the most expensive domain name in history. But is it true? Let’s take a look under the hood to find out more. The company Cars.com was started in 1998 by a group of newspapers eager to continue gaining revenue from printed auto advertising but who also wanted a new souped up platform to ride the wave of the internet revolution of the late ’90s. Since its creation, Cars.com has built an impressive stage that shows off a huge inventory of new and used cars and other vehicles. Described as “the most complete car sales megasite” by Library Journal, the site has detailed listings for sale, as well as financial calculators, dealership reviews and buying guides. Visitors to the site average 31 million per month, 50 percent of which come from a mobile device. Cars.com also provides a range of business options to car brokers: social media strategies, advice on how to respond to negative reviews, analysis of online search patterns, and more. The company has grown to be one of Chicago’s largest digital media businesses. Revenue of $633 million was reported for 2016, up 6 percent year over year, resulting in an 11 percent increase in net income and profits of $176.4 million for the year. Tegna, a broadcasting and digital-media giant, is the parent company who owned Cars.com and who decided to make the call to list the business publicly. Why did they do this? Putting ourselves into reverse gear for a moment, we can follow the history of Cars.com down the winding road to lead us to where the company is today. Cars.com was originally owned by Classified Ventures, a joint venture among five major newspaper publishers that was formed to take advantage of revenue growth in online classified advertising. One of those publishers was Gannett Company. TEGNA is actually a partial anagram of the word Gannett. In 2014, Gannett announced that it would buy all remaining shares of Classified Ventures from the other publishers, giving it full ownership of the company, including its primary asset – Cars.com. At the same time, Gannett announced that it would split into two independent companies. One, a publishing arm that would continue to use the Gannett name, and the other a broadcasting and digital company that would be named Tegna. On May 4, 2017, Tegna shareholders gave the green light for an initial public offering of Cars.com as a publicly traded spin-off. This means that for the first time, the public can buy and trade Cars.com shares, under the ticker symbol CARS on the NYSE. In a nutshell, an initial public offering is when a company first offers shares of stocks to the public. It marks the beginning of a time when private owners of the company give up part of their ownership to public shareholders. This means that anyone can buy shares of, and therefore invest in, Cars.com. There are many reasons to go public. One of the main ones is to allow the company to get enough cash – through the sale of stock to the public – for expansion. As a result, IPOs are generally viewed as positive since it signals to the world that a company is doing well and wishes to obtain more capital to grow. Now that Cars.com has been spun off from Tegna, the company is created as a brand new, independent company. The IPO of Cars.com is a strategic move that keeps as eye on future developments in the automobile industry. As exciting as the IPO is, what about the domain name itself, cars.com? As with any big deal, care is taken to thoroughly understand the financials of the IPO and it is here we find much excitement in the valuation of the domain name. Cars.com is short, memorable and garners a high search volume. Indeed, the keyword “cars” is searched more than 4 million times on average per month around the world and more than 1 million times on average per month in the United States. But it’s not just the SEO-potential that makes it so valuable. The name cars.com is an exact match of the industry that it is trying to serve, which immediately defines it as a premium domain. You want to buy a car? You type in “cars” in a search engine. Other examples of websites like this include computers.com, furniture.com or ticket.com. Websites like these are known as category defining exact match domain names and garner some of the highest domain prices. The entire Cars.com company was valued at $2.5 billion back in 2014. But how do we get a domain value from there? With a physical object like a car, it’s fairly easy to give it a value. One can use comparison sites, online tools or advice from a friend to compare the cost of one car to another. It happens every day on the Cars.com site: look up a used 2002 Toyota Corolla with upwards of 120,000 miles and you’ll see its value is around $2,000. It’s up to you if you’d rather pay for an old banger station wagon from 1978 versus a shiny, new 2017 Audi TT model, but either way, you can easily get a rough idea of a car’s worth without burning too much rubber. But with something non-physical like a domain name, how do you give it a price? It seems like such a simple string of letters when written down, but we need to do a little detective work to understand how such a domain is valued. Intangible assets can be classified as finite-lived or indefinite-lived. A good example of a finite-lived asset might be if a company enters a legal agreement to operate under another company’s fixed-term patent. The patent is said to have a limited life and is classified as a finite-lived or definite asset. Conversely, an indefinite-lived intangible asset doesn’t have any kind of time limit on its expected useful life. An example of this type of asset? Yep, you guessed it – domain names. As part of any IPO, a newly traded public company is required by law to complete a Form S-1 and file it with the U.S. Securities and Exchange Commission (SEC). Digging through the S-1 document filed for Cars.com Inc on May 11, 2017, we start to learn a little more about how the value of cars.com was calculated. For the domain cars.com, this method considers the value created to the owner by historical earnings from the Cars.com website and how much future cash flow the domain name is expected to generate over its life. The cars.com domain valuation requires a good estimate of future cash flows and their risk. To do this, estimates are calculated based on revenues received from advertising on the site, as well as historical data, in addition to public data such as keyword trends and searches. All these factors are used to model projections for future cash flows. Let’s change gears for a second and look at how impairment – one of the main aspects of the Relief-from-Royalty method – affects the cars.com domain name. The risk of future cash flows is one of the hardest parts to calculate and can change quite dramatically due to a variety of circumstances. This is where impairment costs come in. Loosely defined, impairment is a permanent reduction in the value of a company’s asset in the accounting world. It is tested annually or more frequently if there is deemed to be a significant event. In the special case of indefinite-lived intangible assets, the fair value of the asset (i.e., the estimate of the market price of an asset based on future cash flow) is compared with its book value (i.e., the amount that the company has on its books, or accounts, for an asset). If the book value is higher than the fair value, the company must recognize an impairment loss for that asset, and the asset value declines on the company’s balance sheet. For a domain name, impairment losses could include a damaged reputation or, a new use or meaning for the name. In the Cars.com SEC filing, the annual impairment test showed that no impairment loss existed for 2016. So, using the Relief-from Royalty method for the indefinitely lived intangible asset and factoring in impairment losses, how much is the domain cars.com worth? The answer lies in the table below as outlined in the SEC S-1 filing, which has come into light thanks to the IPO. The answer: $872 million for the domain name of cars.com. Wow! Cars.com reported that the domain name represented 34 percent of company assets at December 31, 2016 – $872 million is approximately 34 percent of the $2.5 billion deal value. That amount of money could go a long way in pimping your ride…. Before the Cars.com deal, the sale of insurance.com for $35.6 million in 2010 was the most expensive domain name that was for sale. But now, the value of cars.com completely crushes all others! Valuing cars.com at $872 million means that the value of the domain is more than 20 times greater than the previous largest domain sale. In fact, cars.com even dwarfs the sum of the entire Top 10 previously most expensive domain name sales listed on DomainSherpa. That’s seriously impressive! Hold on, even after taking a deep dive into what drives the price of cars.com, a value of $872 million still seems really high for just a domain name, right? Well, no, not when you consider just how much automakers spend on advertising each year. Cars sales and particularly car sales advertising is a megamillion-dollar business. With the most premium domain name in the industry, it’s no wonder that the valuation for cars.com sits at well over $800 million. As you can see from Ford and GM, each company’s total yearly ad spending was more than quadruple the valuation of the domain cars.com, and up over 8 percent from the previous year, signalling a huge amount of potential for Cars.com. Given the staggering annual spend on advertising, the frequency of internet searches for “cars” and the indefinite life-span of the domain name, it starts to become clear why cars.com is valued at a mega $872 million. 1.2 billion vehicles are currently on the world’s roads and reports suggest vehicle numbers will hit 2 billion by 2035. Thousands of hits daily on major search engines are for new or used cars for sale and there’s no reason to expect searches will be slamming the brakes anytime soon. Around the globe the future use and growth in production of cars looks to be in line with population expansion, which means almost certain growth for the automobile industry. For the newly created Cars.com, this means it’s time to fire on all cylinders and get ready for the future. Buckle up: it’s time to get this show on the road. Special thanks to George Kirikos (@GeorgeKirikos) for discovering the SEC information and Gordon H. Hayes of DomainNiches.com for the background information. Holy Moly! There may be something to this Domain Name thing! 🙂 … Great Article! LOL! Not sure why but your comment made me laugh so hard! Great article. I saw this pass on my Twitter stream, but I didn’t understand what was going on. Great article, and very well put together. Also great to see this valuable name in the context of other sales, e.g., PrivateJet.com for $30.18 million. It’s been more than 3 years I am in the domaining industry. 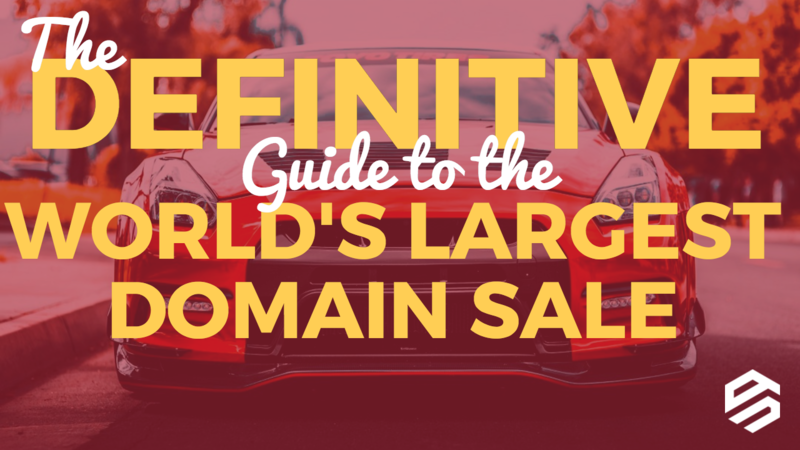 I am glad to read such an excellent piece of content on domain valuation and sales. Thanks @Michael Cyger. Great article Michael thanks for sharing. I own CAR.toys….I am prepared to swap with Cars.com, d’ythink they’d be interested? Only joking RamBabu…its our British sense of humour! As strange as I’m typing this now, who’s to say that 🚗.ws or even 🚗.com (if ICANN can think about the consumer) won’t overtake cars.com in top search? Seeing that 2 of the top 10 domain sales are insurance related makes me feel a lot better about bucking up for InsuranceBrokers.com in 2017. Great guide Michael! Most of the posts in the industry have become repetitive but this is something new with fresh and in-depth insight, thanks! Interesting and well written article Michael, congratulations. So as a domain name is an Indefinite-lived Intangible Asset of a company, there should be a way to value a domain name based on a businesses revenues generated by owning that domain. So a business which is based solely on its domain name itself, not as an identifier, but the entire business, such as a geographic domain, there should be a fairly simple calculation process of the value of the domain name based on a companies sales volume, over how many years do you think? Well done . . .
Michael, I just read your article again while doing some research and I must say . . . your article and analysis is the best one I’ve seen on this CAR.com phenomenon to date. Keep up the good work and we may be on the cusp of absolute huge increases in value for Domain/Website Names . . .
Well Michael you have even convinced a finance man the logic behind your valuation. Well done article! Excellent article! Very informative and sheds light on how one might value similar domains. Thanks, Michael, for going beyond the domainer sphere and illuminating the business context that drove the sale! Very helpful. Thanks for your great analysis.Really helpful, God bless you.